Topics: Treefort, Gilbert, Antler Crafts, Rihanna,Tidal, Streaming, Trails And Ways, Waterstrider, Bells Atlas, Makeunder, Woodland Empire, Marshall Poole, Bearcubbin'! Party Boyz, Sisters, Spaceface. 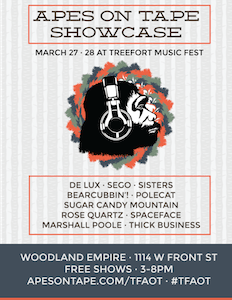 Read: Nick's "Thoughts On Treefort Fest 2015"